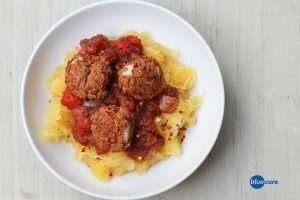 Swap out the meat and white-noodles for protein-packed bean balls and spaghetti squash; a light, and nutrient-dense meal that is also satisfying. The bean balls use flax, which is a food that may help lower risk for prostate cancer. Spaghetti squash is a good source of fiber and vitamin C, and a great way to include more veggies in a meal since it has a similar texture of spaghetti noodles. Pair the meal with your favorite marinara sauce, or make your own! Either way, adding cooked tomatoes to the meal boosts the lycopene content— further helping to reduce prostate cancer. *Note: the bean balls will be slightly mushy at first, but as they cool– they will firm up. They actually taste best the next day, in my honest opinion. Preheat the oven to 350F. Line a pan with parchment paper. Dice the onion into small pieces. Rinse the beans and pour in a bowl. Mash the beans with the back of a fork or with a potato masher. Add in the flax, tomato paste, garlic, thyme, and nutritional yeast. Continue to mash and stir. Finally, mixed in the onion. Roll the bean mixture into 12-16 bean balls. Place the balls onto the pan. Cook in the oven for 40-50 minutes and then allow to cool. The bean balls will firm-up as they cool. 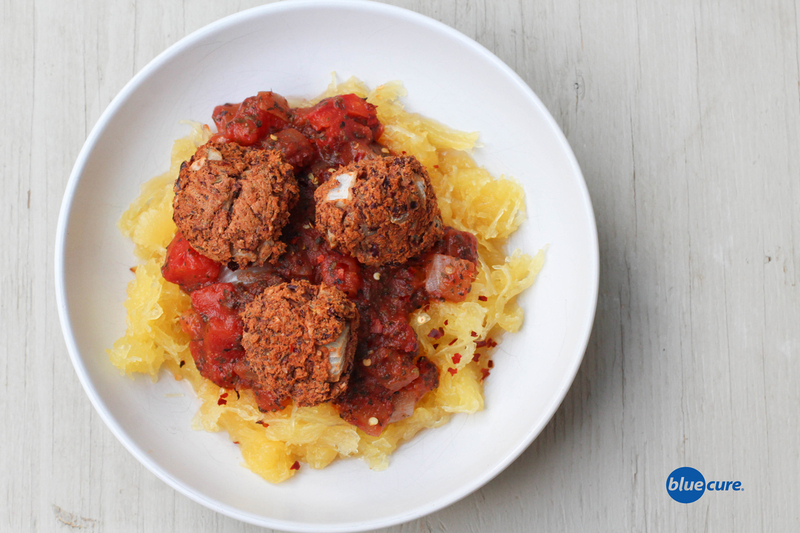 While the bean balls are cooking, wash the spaghetti squash. Cut the squash lengthwise in half and discard the seeds using spoon. Place the squash flesh side down on a sheet with edges and pour 1/4- 1/2 cup water on the pan. Cook the squash for 30-40 minutes or until the flesh is soft. Allow the squash to cool for a few minutes, then using a fork scrape the flesh surface lengthwise to create spaghetti. While the squash and bean balls are cooking, prepare the sauce. In a saucepan, combine the tomatoes, tomato paste, spices, and water. Stir and then heat on medium-high heat until the sauce boils and then reduce to a simmer. Stir often to avoid burning. *Cook until tomatoes have reduced to a sauce or leave the tomato pieces whole. Layer the ingredients in a bowls. Serve with a side salad or roasted veggies.